After years of attempts to remain viable in a cut-throat global manufacturing environment, the GE refrigerator plant in Bloomington, Ind., was the site of good news on Monday. 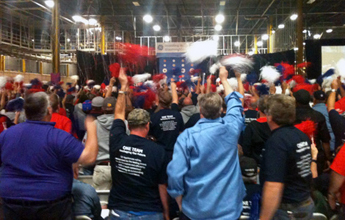 The factory, which employs 585 members of Local 2249, will hire 200 more workers, part of a $93 million facility upgrade to add a new line of side-by-side refrigerators that will incorporate “green” insulation and other components. In 2008, we were on that obituary list. It was us. I hope this example will become a blueprint for company-labor relations and help reinvent manufacturing in the United States. On Monday, GE shut down the plant temporarily to gather workers as well as local and state officials to share the news that instead of closing, selling, or spinning off the plant, the company was in fact making a major investment in the facility, adding the new line in Bloomington and bringing some jobs back to the United States from Mexico. IBEW International President Edwin D. Hill and Sixth District Vice President Lonnie Stephenson were in Bloomington for the announcement. The Bloomington plant is among four that will benefit from the $432 million investment in “cool refrigeration” technology. The move will create 500 new green jobs by 2014 and brings GE’s total U.S. investment in appliance manufacturing announced since 2009 to more than $1 billion and jobs created to 1,300. A company release says the factories will use a top-to-bottom redesign process that maximizes efficiency known as “lean” manufacturing. Most of the new units will be smart grid-enabled to save energy and cut costs. They’ll use refrigeration insulation that dramatically cuts greenhouse gas emissions. And the plants themselves will reduce carbon emissions 90 percent, GE says. Thomas said 2008’s closure announcement galvanized the work force, somehow motivating the members to try a little harder. The remarkable thing about it was we went to work, our quality got better, we improved our safety, our quality got better, and we were putting out a better product than ever before. Then came word from the company, in late 2009, of an official “re-evaluation.” The workers didn’t know what to think. Nearly 200 workers were on layoff, after 100 left on early retirement. The announcement, the company calls a marriage of high efficiency manufacturing and green technology, means the 24 members still out on layoff, will return to work soon. The IBEW’s agreement with GE also includes assurances from the company that it will attempt to use local supply vendors. The move will mean easier access to parts as well as greater quality control, Thomas said. They can outsource American jobs, but they can’t outsource the American spirit.